While the bout itself has yet to be formally announced, it’s entirely possible that by as early as Tuesday the heavily rumored showdown between Manny Pacquiao and Adrien Broner could very well have a fight date, location and televised platform. The Nevada State Athletic Commission will meet on Tuesday, October 23 for its monthly agenda hearing, which covers reviews of past events and approvals for requested future business conducted in the state. Among the budget items is a list of three requested fight dates for TGB Promotions, with plans to stage events on January 19, February 16 and March 9 all at the MGM Grand Garden Arena in Las Vegas. A Pacquiao-Broner showdown has been targeted for January 19, according to several sources who’ve declined to speak any further on the matter—even off the record—and with Las Vegas as the most likely location. All three dates are currently slated for the rebranded version of Premier Boxing Champions (PBC) on Fox, a development first reported by RingTV.com senior writer Mike Coppinger. PBC renewed long-term deals with Fox and Showtime, both of whom remain very interested in airing this event although BoxingInsider.com has learned through three credible sources that no decision has yet been made and likely won’t until the fight is formally announced. The first Fox prime telecast under the renewed PBC on Fox series is currently slated for December 22, with plans to run shows once per month. There also exists the possibility of one or more of those dates moving to a Fox-distributed Pay-Per-View event, according to details revealed in the initial announcement this past September. Speculation has already begun about Pacquiao-Broner likely going that route, as the price tag that would come with such a fight would figure to heavily eat into the allotted annual budget provided by either Fox or Showtime. Talks of the matchup surfaced almost immediately after it was revealed that Pacquiao—the only eight-division titlist in boxing history and currently a secondary beltholder at welterweight—inked a deal with adviser Al Haymon, who founded PBC in 2015. The move came as a surprise only from a historical perspective. Pacquiao managed to miss out on several key fights at welterweight due to his fighting for years under the Top Rank promotional banner, whose founder Bob Arum has been embroiled in a years-long feud with Haymon. The heart of that standoff stems from Haymon’s relationship with Floyd Mayweather, who left Top Rank for good in 2006 and has since emerged as the biggest box office attraction in boxing history. Arum and Haymon were literally locked in a room and forced to do business together at the demand of Les Moonves, then head of CBS Corporation (parent company of Showtime) to make Mayweather-Pacquiao a reality in 2015 after more than five years of their careers managing to run parallel. The bout itself was a stinker—with Mayweather winning a wide but dull unanimous decision—as was the half-assed promotion offered by Mayweather Promotions which demanded lead status. Still, the most anticipated boxing event of the 21st Century secured box office benchmarks which will likely never be surpassed, including more than $72 million at the live gate and more than $400 million in U.S. PPV revenue. At the time, it was believed to be a one-and-done event, with the 12 rounds of non-action and the nauseating building not providing any reason to do it all again. However, the two were recently at the same event in Japan this past September and took to social media together in teasing the possibility off a rematch in 2019. The postings came on the morning of the rematch between Saul ‘Canelo’ Alvarez and Genandy Golovkin, leading many to believe it was just another tactic employed by Mayweather to upstage any event involving Golden Boy Promotions. He did as much in announcing his one-fight return to the sport in 2017, staging his August ’17 bout with UFC superstar and boxing debutante Conor McGregor in Las Vegas just three weeks prior to Alvarez-Golovkin I and drawing four times as many PPV buys. Few paid this recent round of trolling any mind, until it was revealed that Pacquiao—no longer under contract with Top Rank—had joined forces with Haymon and the PBC family. There still doesn’t exist any real possibility of Mayweather-Pacquiao II, with Mayweather having not fought since the aforementioned highly lucrative McGregor sideshow and more interested in boxing vs. UFC pairings (rematch with McGregor, or a first fight with his most recent conqueror and UFC pound-for-pound king Khabib Nurmagomedov). By his own admission, a Pacquiao rematch requires more public massaging. In that vain came the idea to pair Pacquiao with Broner, a former four-division titlist who has long ago maxed out his boxing celebrity credit card and could stand a notable win or two in the twilight of a frustrating career. Broner has not fought since a 12-round draw with Jessie Vargas this past April. The 29-year old from Cincinnati has not won a fight since a narrow victory over Adrian Granados in his hometown last February. Pacquiao is 3-1 in his life after Mayweather, managing to win some version of a welterweight title in each victory. He entered as the challenger in a pair of 2016 unanimous decisions in Las Vegas over Tim Bradley (in their third fight) and Vargas bookending his successful turn at securing one of 12 open Senate seats in his native Philippines during the general election, following a two-term tour as a Congressman in the Sarangani province. His title reign following the Vargas win lasted just under eight months, ending in highly controversial fashion in losing an unpopular split decision to Jeff Horn last August in his opponent’s native Australia homeland. Efforts to secure a rematch proved exhausting, also signaling the end of a nearly two-decade long stint with Top Rank. Their last bit of business together came in July, when the Las Vegas-based company secured the U.S. TV distribution rights for his stoppage win over Lucas Matthysse. The bout took place in Malaysia, with Top Rank managing to distribute via ESPN+ through its ESPN deal. 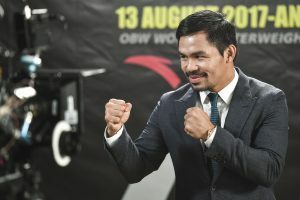 A subsequent dispute came when Pacquiao claimed to have not been properly paid the rights fee by Top Rank, with the two sides settling before moving about their separate ways. Now under the PBC banner, Pacquiao’s debut on the other side of the street is not without its snags. The Filipino southpaw has yet to resolve a multi-million dollar tax debt with the U.S. IRS, the principle cause for his having not fought stateside since the Vargas bout. That financial matter will need to be resolved before Pacquiao can ever again fight in the U.S. However, it won’t have any bearing on whether the Nevada commission approves TGB Promotions’ fight date requests, since none come with solidified main events including the planned January 19 show in Las Vegas. Still, Pacquiao didn’t head to PBC just to sit on the sidelines or for the outfit—which has yet to stage a branded event outside of the U.S.—to take its act overseas on his behalf. Chances are, his tax status will soon be resolved—whether fully settled or through a long-term installment agreement—as will full details of his forthcoming showdown with Broner.